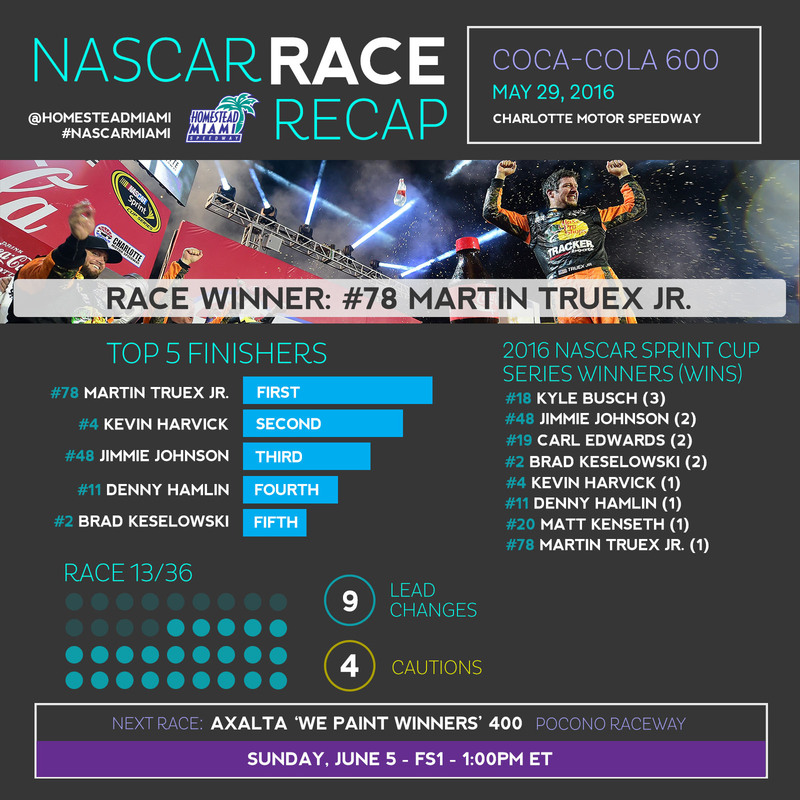 · Martin Truex Jr. won the 57th annual Coca-Cola 600 at Charlotte Motor Speedway Sunday night, his fourth win in 382 NASCAR Sprint Cup Series races. It is his first victory and sixth top-10 finish of 2016. · This is Truex’s first win and seventh top-10 finish in 22 career races at Charlotte Motor Speedway. 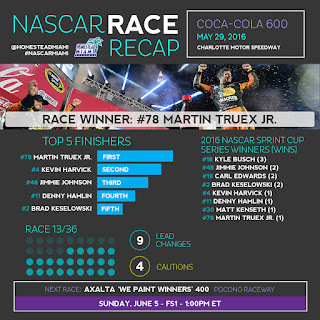 · Truex led for 392 of the 400-lap race, a record for the Coca-Cola 600. He also led for a total of 588 miles, the most-ever in any NASCAR race. · Truex became the first driver to win the Coca-Cola 600 from the pole since David Pearson in 1976. · Furniture Row Racing is the first single-car team to win the Coca-Cola 600 since Bobby Labonte won the race in 1995 driving for Joe Gibbs Racing. · The time of the race was the shortest in the history of the Coca-Cola 600 (3:44:08). · Kevin Harvick (second) posted his 14th top-10 showing in 31 races at Charlotte Motor Speedway. It was his ninth top-10 finish and sixth top-5 of 2016. · Jimmie Johnson (third) compiled his 18th top-10 finish in 30 races at Charlotte Motor Speedway. It was his seventh top-10 finish of 2016 and his sixth in the top-5. · Chase Elliott (8th) was the highest finishing rookie tonight. · With the win, Martin Truex Jr. becomes the eighth driver to qualify for the 2016 Chase for the NASCAR Sprint Cup, a list which also includes Carl Edwards, Kyle Busch, Denny Hamlin, Jimmie Johnson, Brad Keselowski, Kevin Harvick and Matt Kenseth, all of who have taken checkered flags this year. The Chase culminates with the Ford EcoBoost 400 Championship race on November 20 at Homestead-Miami Speedway. · In 11 career Sprint Cup starts at Homestead-Miami Speedway, Martin Truex Jr. has posted seven top-10 finishes and three top 5s. He finished 12th in the 2015 Ford EcoBoost 400 when he was part of the Championship 4.